When he was alive, Babe Ruth was a prolific signer. 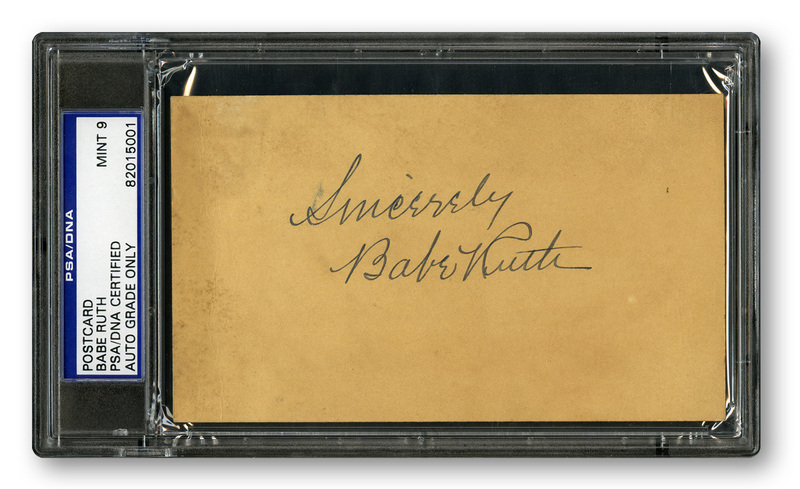 And while there are still plenty of Babe Ruth autographs available today, demand will always exceed supply. 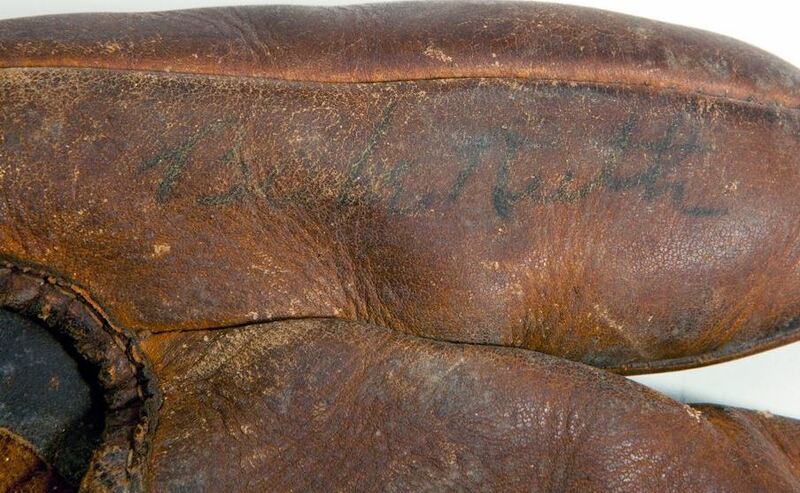 Given the high amounts authentic Babe Ruth autographs sell for, it shouldn't be a surprise that he has the distinction of being one of the most forged signatures in sports. 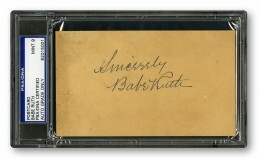 Below you will find examples of what an authentic Babe Ruth signature autograph looks like. 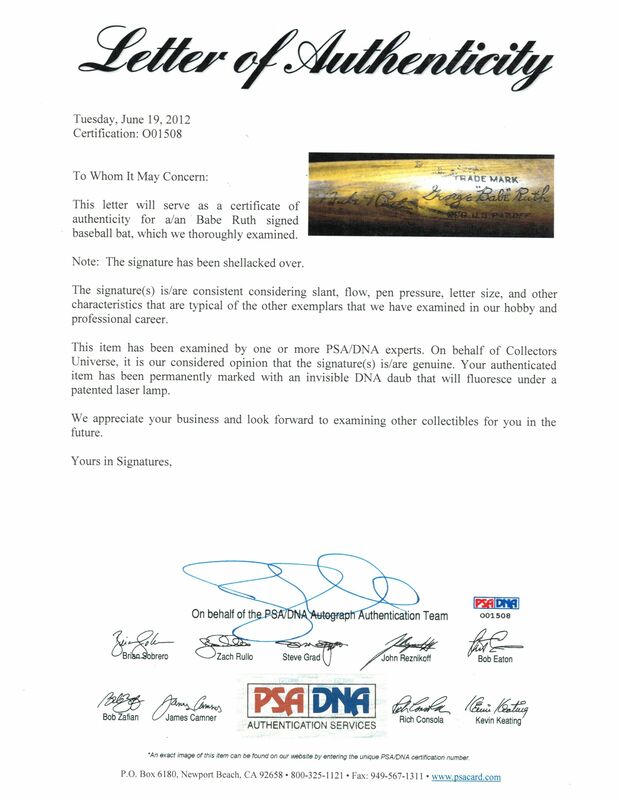 This can be used as a first point of reference for determining the legitimacy of Ruth's autographed memorabilia. 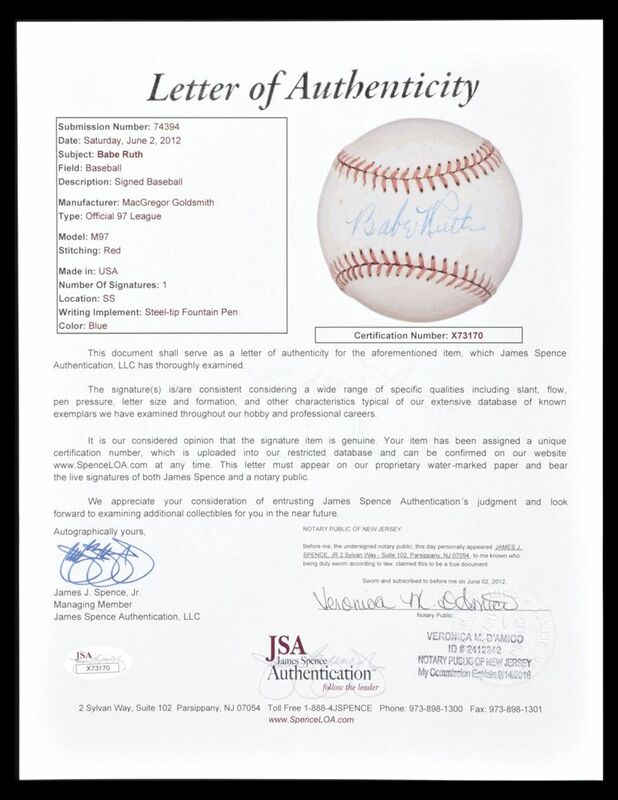 It shouldn't be a substitute for having your items authenticated by a well-respected professional autograph authentication company. 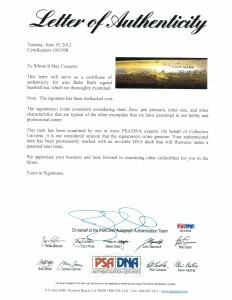 Some of the trusted sources within the sports memorabilia market include PSA, JSA and MEARS. Click on any of the images below to view full size photos. The entire signature is written in legible cursive. The signature is written on a level plane. The letter "B" displays a curl on the left to start the letter and contains two distinguishable, rounded letter segments with the top of the letter "B" being at a slight upward angle. The pen lifts before starting the letter "a" which is almost always a closed loop. The letter "b" 's vertical line is not a loop but an actual line. The letter "e" resembles more of a miniature capital letter "E."
A similar start to the letter "R" as the "B" with a curl flows into a pronounced and slightly over-sized letter "R."
The loop of the "R" almost makes the shape of a sideways teardrop or caption bubble. The letter "u" has an upstroke slightly larger on the second. The letter "t" is seen both as a vertical loop and a straight line, it is always crossed towards the near top with an over-sized line. The letter "h" is almost always represent with its vertical line as a loop, with the crossing of the letter "t" bisecting the loop of the letter "h."
While they do exist, he rarely signed his full name "George Herman Ruth." The age of the ink and medium signed must be consistent with the time period in which Ruth lived. A common practice of the era was to shellac or varnish an autographed baseball. As a result many forgers employ this method to give the ball an antiquated appearance. Ruth possessed a very legible signature, making it prone to forgery. 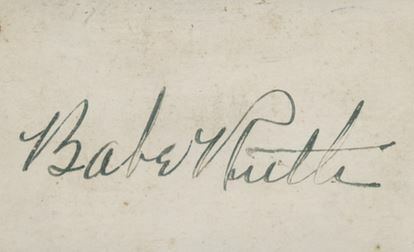 Ruth's signature nuances vary over time, also aiding to ease of forgery. Always get a second or even third opinion before purchasing a Babe Ruth signature. Unfortunately, be aware that even authenticators make mistakes. Click on images for magnification. 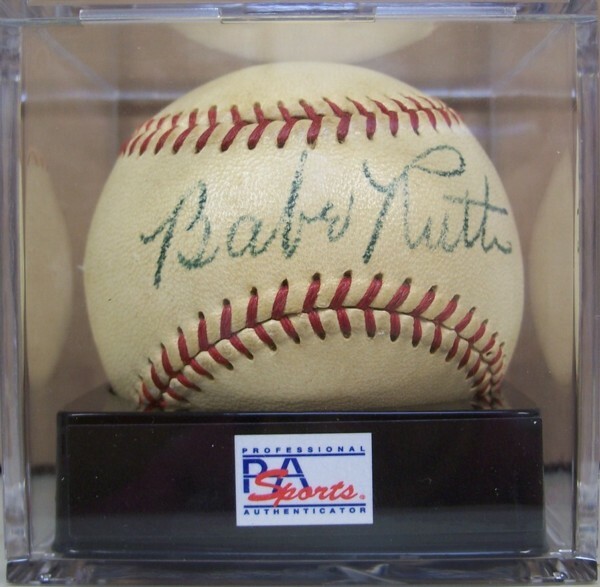 When it comes to sports memorabilia, few players or athletes can reach the heights that Babe Ruth can in terms of realized prices. 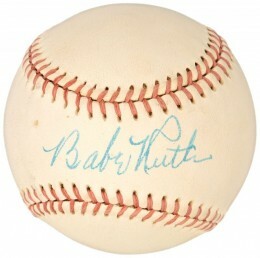 In fact, of the top ten selling sports memorabilia pieces of all-time, Ruth holds four of them. 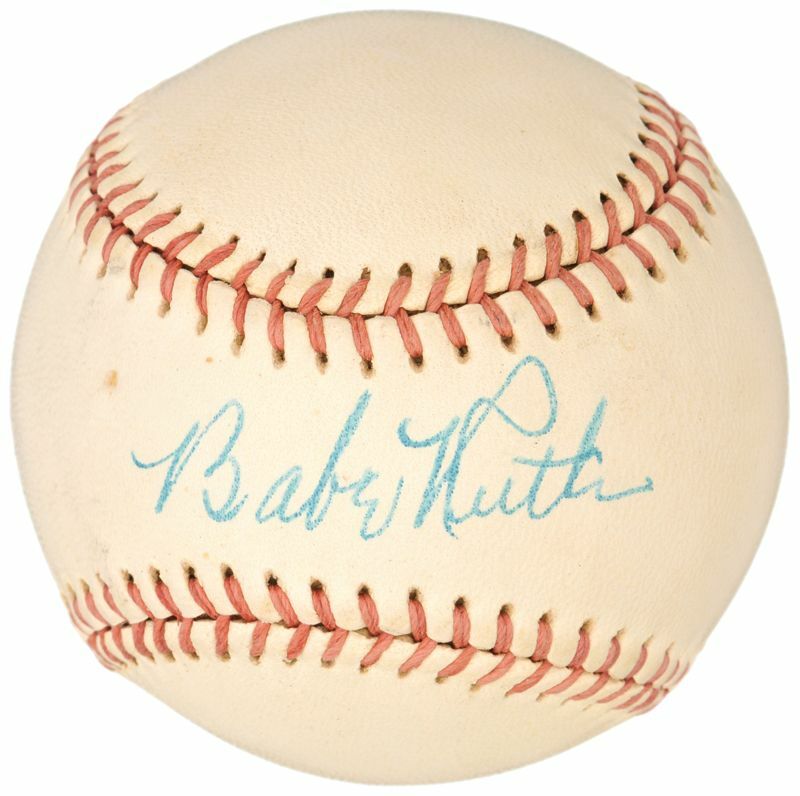 Here is a quick look at the Babe Ruth baseball memorabilia with the highest price tags. 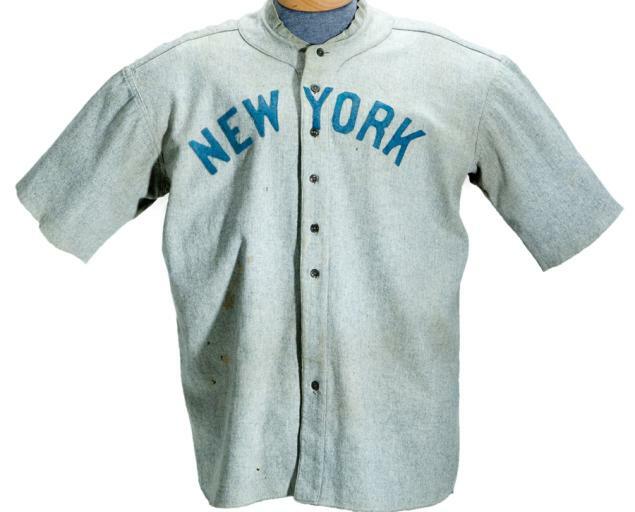 Sold in June,2005 in an auction by Grey Flannel, authenticators used detailed photo-matching analysis to determine the jersey's authenticity. 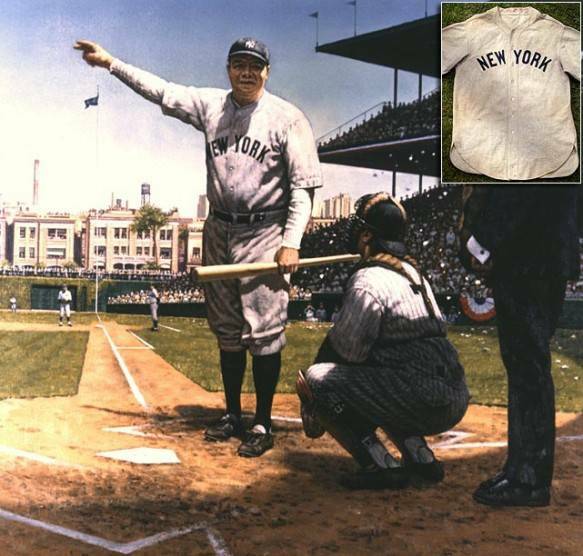 SCD Authentic's lead authenticator, Dave Bushing, confirmed the piece's authenticity, in part using an original transparency of the "New York" letter stenciling that was used to help affix the letters to the jersey. The once ominous "Curse of the Bambino" has this document to thank for its very existence. In 1919, Boston Red Sox owner, Harry Freeze, essentially 'sold' Babe Ruth to the New York Yankees. It wouldn't be until 2004 that the Red Sox would win a World Series title again. The esteemed Sotheby's auction house in New York handled the transaction in June, 2005. It's amazing to think that something so specific could be authenticated at all. However, the provenance of the bat is air-tight and indisputable. Ruth gave the bat to the Los Angeles Evening Herald as a prize in a home run hitting contest sponsored by the newspaper. The contest winner was Victor Orsatti. 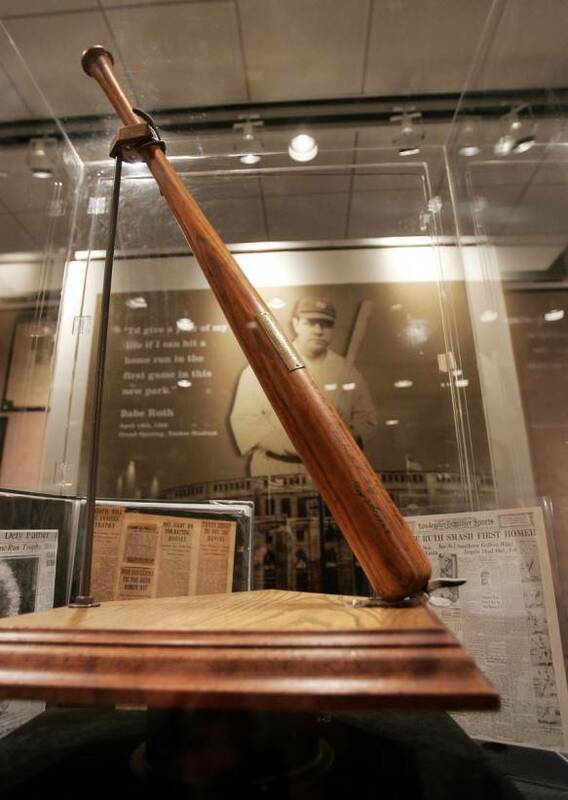 Ruth inscribed on the bat, "To the Boy Home Run King of Los Angeles 'Babe' Ruth, N.Y. May 7, 1923." It was sold through SCP Auctions in 2004. This piece represents the highest price, to date, paid for a piece of sports memorabilia. This exquisite game-worn Babe Ruth jersey dates back to around 1920. It was sold through SCP Auctions in May, 2012. It is the earliest known Ruth jersey in existence. My alleged autographed baseball by Babe Ruth dated June 6, 1927: The R in Ruth appears to be conventional and has no curvatures. Did Babe’s Rs ever vary??? Many thanks! i have an complete team of los angles dodgers baseball cards when babe ruth was on the team,,,the whole team of cards,,,is this worth anything to you????? That would be a neat trick, David, as Babe Ruth died10 years before the Dodgers moved to L.A. I am looking for a bat that was displayed in Plaster Rock New Brunswick Canada in the 90’s or there abouts. It had Babe Ruth’s signature and a lesser known ball player who had a short career playing for the St. Louis Cardinals named Vincent William Shields. My sister saw it in a display case in Plaster Rock in the 90’s so there is a bat out there somewhere. Sadly, it is not in the display case at the Tobique Arena where the case was moved from the Lion’s Hall to the Arena. I have a Babe Ruth endorsed straight razor with his silhouette in the handle, made of bakelite. The razor was made in the 1920s. It was made in Germany for the Pairo Bros. Co. of St. Louis. The handle is bakelite. It may well have been during the time he was with the St Louis Browns. I am at work so do not have all the info at this time. I am interested in selling it and can forward a picture if interested. I have a Babe Ruth signature ball that was signed in the Fall of 1924 during a visit to Los Angeles. Can you direct me to information regarding that trip? Also any information on the value of the ball? I have a dollar bill that is signed by Babe Ruth. The story goes that my great Aunt was a nurse in a hospital when he broke his leg. (I don’t follow his life story and don’t know that he broke his leg, but that’s the story). The dollar has been the family the whole time. The autograph is a perfect match to the examples you show. My question is what is it worth. What is a 1929 WS Program from Wrigley w/ Babe Ruths signature worth! Did not play, signed program while watching game with his wife! I have an autograph picture of Babe Ruth 16th homerun, and an autograph picture of Babe Ruth and Lou Gegrig standing side by side in their babeball uniforms. Any value? 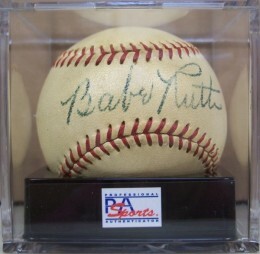 I have a babe ruth signed baseball left to me when my uncle had died. How or where do I go to get it authenticated? I live in PA. Any help would be appreciated. PSA/DNA and JSA would probably be the best companies to contact. 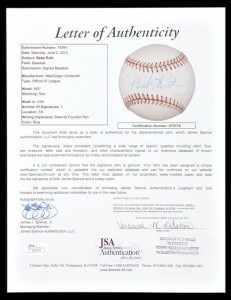 With a Ruth ball, it might even be worth it to get it authenticated by both. I have a photo of the babe with someone else who I can not put a name to that a family member has when they passed. I do believe it’s signed but it is faded. They are both hunting with rifles in hand. Anything on stuff like this? 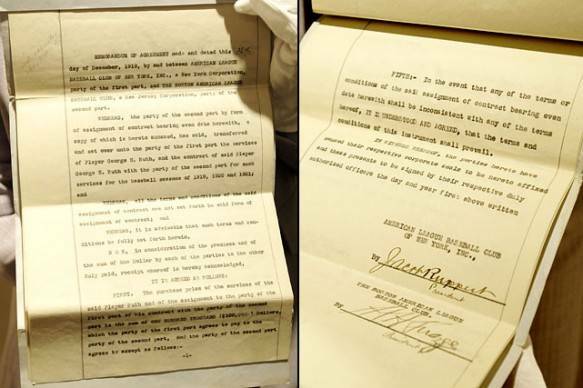 What is the replica of Babe Ruth’s first contract with the Yankees, given on the 100 year anniversary this year in may at Yankees Stadium worth? I have a picture of Babe Ruth and Lou Gehrig posing w/ the West New Yorkers. My Grand father is in the pic and played for them. Not the they played ball with him. Was a promotional thing I imagine. You’ll never find one like it and I would like to know the value?. As I was told $10,000 or more. Would be up for sale if this was true. Fallin on hard times & need the cash that badly. Yeah. I’m a sorry a$$.. I have an autograph that looks old and exactly like the middle autograph. Its on a rectangle piece of paper and above it is a 1933 Green Big League Chew card. I would love to know if they are real. I have a signed Babe Ruth picture, is it worth getting it authenticated? What would its value be? Thanks for the help. I have a March 19, 1920 copy of Babe Ruth’s Hartford Insurance policy that has the signature George Herman Ruth on. On the back is copied a Sherwood M. Hard & Co.,Inc. Insurance Brokers insurance copy. Is this Insurance copy authentic? Did Ruth at any point in time put “babe” in quotes? 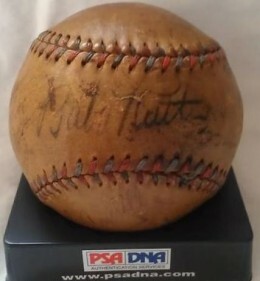 I have a very old ball signed like that, that also has Mickey mantle’ s signature that looks spot on. It’s a family heirloom. Any idea if he signed like that early in his career? I have an original black and white photo of Babe Ruth in his swim trunks standing next to the Duke of Hawaii. It’s from the WWII era. Anybody have any suggestions where I could value it or roughly what it might be worth? I have an opportunity to purchase a photo of babe ruth surrounded by kids when he was older. There is a black kid in the photo to the right and a kid wearing a hat that says chuck in the middle, however, the print of this one is reversed and has the black kid on the left and the hat has chuck spelled backwards. Can you tell me what this misprint would be worth so I don’t overpay. Thanks. Do you have a BABE RUTH baseball for sale…Respectfully Herbert Eustis,RETIRED…. I have a play ball signatures booklet from 1941 I bought at an auction – the signatures are all reproductions, but there are two autographs that were added in – Ty Cobb and Babe Ruth, along with a note from the owner, describing how he was in the dugout with Ty and Babe, got their autographs and talked with them, and a newspaper clipping of the event, with a note saying “I was there!”. I also bought numerous Play Ball cards from 1940 and 1941 and several old baseball books. The guy was a big collector, he just passed away in his 90’s – He had several signed baseballs, along with signed and authenticated signed presidential documents (T. Roosevelt and Garfield), and he was a well known attorney, so I believe everything is genuine. Any idea what the Cobb/Ruth piece is worth, and the best way to approach selling?